When I went to South Cotabato last year, I fell in love with the place. So when I found out that Region 12 had a pop-up store at DTI Makati, I knew I had to go there! And so I did. I went there at 8AM yesterday to look at what they were selling. It was easy to find the space since upon entering DTI Makati, it's what you immediately see at the right side. Greeting me at the entrance is La'ang Dulay, the national artist and dreamweaver of South Cotabato. It was a hall of various Region 12 products which you'd normally have to travel for so you can buy some. Luckily, they went to Makati to make it accessible for us. There were many items from the dreamweavers of South Cotabato. This ranged from raw T'nalak and different clothing and fashion items as well as metal decor from the T'boli tribe. I bought 1 meter of T'nalak which I kept in case I wanted to do a DIY with it but there is no doubt that when you look closely to the cloth, you'd see the intricate design which is not present with fast fabric produced in the market today. The wide selection of food is something to look forward to as well. This is the main reason why I went to the trade show. South Cotabato is the only place where I got to finish 3/4 of a pineapple in less than 0.5 hours. Catch is, I don't eat pineapples but theirs is so fresh and full of water for hydration. If not for the baggage limit at the airport, I would have hoarded those! If you also love General Santos's tuna, they are selling those too! You wouldn't have to travel far to get some of that. Well, the main reason why I went there is because of Kablon Farms chocolates. The moment I knew that I can buy Kablon Farms chocolate bars in Makati, I knew I had to get some. I have always bugged friends who have gone to South Cotabato to bring me these chocolate bars because the moment I tasted it last year, they became my favorite! There were also photographs of South Cotabato by my previous colleague, Mac Dillera, which were displayed at the venue. Here are my favorites. I bought 10 Kablon Farms chocolate bars earlier and shared 4 bars with my office mates. They asked me if the chocolates were imported and I said "Nope. These are from South Cotabato!" They couldn't believe it. They said it looked imported because of the packaging. I agree. Where is DTI Makati located? 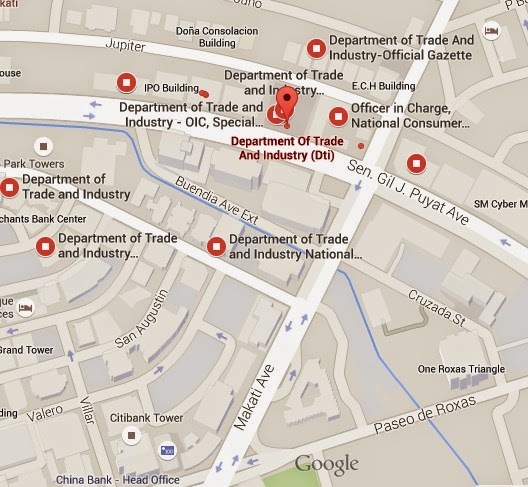 DTI Makati is located at Sen Gil Puyat Ave, just before it intersects with Makati Avenue. It is beside SSS abd one landmark near it is also the Petron gas station. For the chocolates, it depends on the variant but the price range is Php54 - Php65. For the other food and items, I'd say buy them here since with other distribution channels here at Manila, they have surcharges. Here, you are technically buying from the merchants themselves with DOT and DTI as the mediator. 8AM - 5PM. It follows government office hours since it's inside the DTI building. I assure you that you can already buy at 8AM because the cashier is already there. Until when is the exhibit? It will be until next week, the end of May.